Do you enjoy carb loading? Me too. Do you eat Italian bread with your pasta? If you love pasta and bread and then more pasta, you may feel better if your carbs are accompanied by a bunch of roasted veggies.. This recipe is so easy and will be so affordable now that the farmers markets are open. Tip- since your oven is already on, why not slice the tops off some garlic, drizzle with olive oil, sprinkle salt & wrap in tin foil…stick in the oven and when your veggies are done roasting- you will have sweet yummy roasted garlic to spread on your bread as an appetizer to your carb loading meal woohoo! Wash and cut your veggies as desired. Meanwhile, cook the pasta in a large pot of boiling salted water until al dente, tender but still firm to the bite, about 8 minutes. Drain, reserving 1 cup of the cooking liquid. 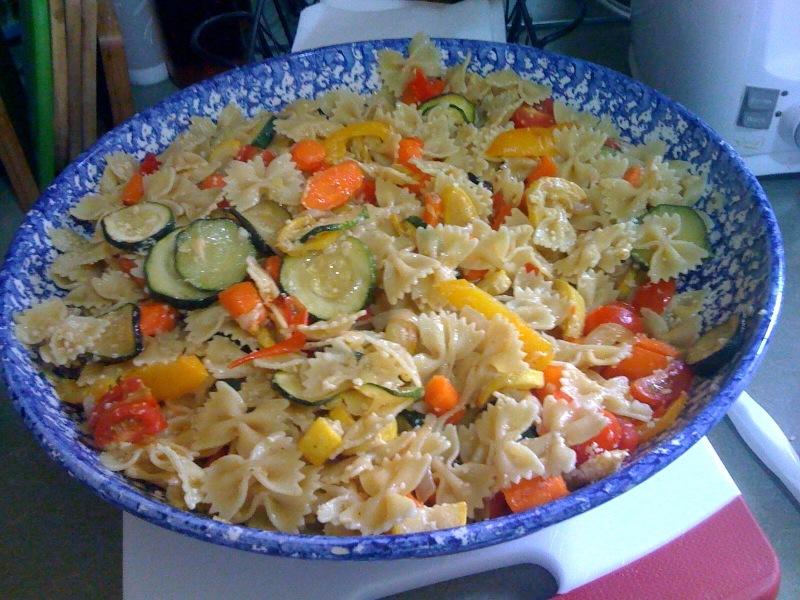 Toss the pasta with the vegetable mixtures in a large bowl to combine. Toss with the cherry tomatoes and enough reserved cooking liquid to moisten (I only used about 1/4 cup). Season the pasta with salt and pepper, to taste. Sprinkle with the Parmesan and serve immediately.. This entry was posted in Lunch or Dinner and tagged Carb Loading, Farmers Market, Giada De Laurentiis, Low Cost Meal, Pasta, Roasted Garlic, Roasted Vegetables. Bookmark the permalink.